Based on breakthrough Field Effect Biosensing (FEB) technology, Agile R100 monitors small molecules with no lower size limits. 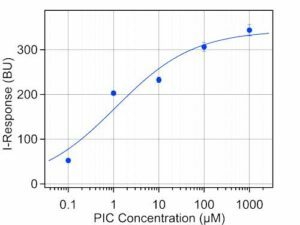 Data from Agile R100 showing dose-response curve of 0.1 – 1000 µM small molecule PIC in 1X PBS buffer with 1% DMSO binding to immobilized SYK. 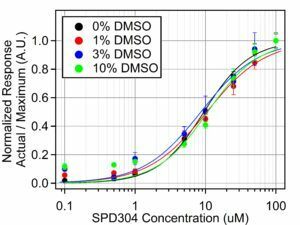 Data from Agile R100 showing dose-response curve of 0.03 – 30 µM small molecule SPD304 in 1X PBS buffer with 10% DMSO binding to immobilized TNFα. 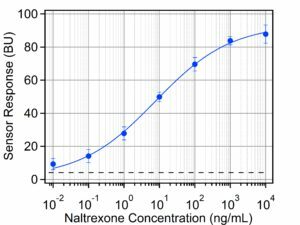 Dose-response curve of small molecule naltrexone binding to immobilized GPCR. Data taken at University of Pennsylvania with a LOD of 10 pg/mL and was validated by ELISA with a LOD of 1 ng/mL. Lerner et al., ACS NanoLetters 2014. 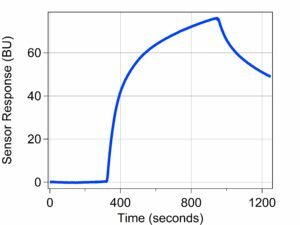 Data from Agile R100 showing dose-response curve of 0.01 – 10.7 ug/mL kinase in 1X PBS buffer binding to immobilized peptide. Non-optical technology enables Agile R100 to detect in DMSO without need for solvent correction, reducing time to data. Data from Agile R100 showing four dose-response curves of SPD304 binding to TNFα in four different concentrations of DMSO. The highest concentration of SPD304 used was 100 µM. Agile biosensor chips are made with graphene, a single atomic layer of carbon. Every atom of graphene is exposed to the environment, making it highly sensitive to the change in conductance caused by interaction or binding that occurs on the sensor surface. This enables detection even with small amounts of starting material, small volumes, low concentrations, and weak biomolecular interactions. Overlaid sensorgrams generated by Agile Plus software showing kinetic characterization of IL6 binding to an immobilized anti-IL6 antibody. Agile R100 is designed to use small volumes. 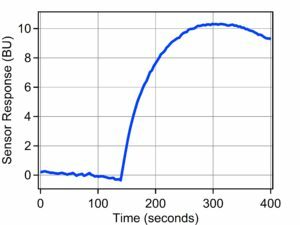 Only a 10 µL drop of sample is needed to measure a response, and only 1 pg per square mm of immobilized target is required for accurate data. 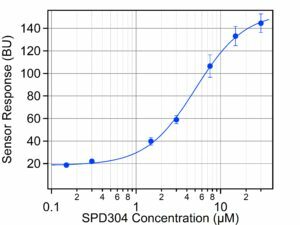 Data from Agile R100 showing 10 µM of SPD304 target analyte in 1X PBS buffer with 10% DMSO binding to 10.2 nM of immobilized TNFα. Data from Agile R100 showing 4 nL of llama serum analyte diluted in 1X PBS with 0.1% tween buffer binding to 11 nM Borrelia burgdorferi bacteria. Simple-step, well-based design enables kinetic binding data within minutes of sample prep, ideal for measuring unstable compounds. 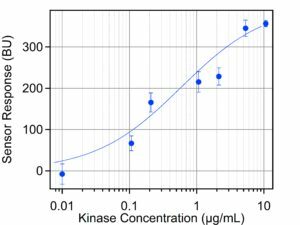 Data from Agile R100 showing recombinant kinase in PBS buffer binding to an immobilized peptide therapeutic. In-line reference measurement was completed in 100 seconds, and binding measurement completed in 300 seconds.